If you are facing extensive sewer repairs at your residential, commercial, or industrial property, and simply do not want to deal with having your landscaping and hardscaping destroyed in the process than we have some great news for you. Sewer repair in Oklahoma City does not need to be the destructive, time consuming, and ridiculously expensive process that most property owners believe it to be. Thanks to advances in plumbing technology, plumbing contractors like Nu Flow Technologies no longer need to rely on the old school excavation method. The days of digging large trenches along the sewer pipeline in order to expose the pipes for repair can be a thing of the past. Property owners no longer need to sit by and watch as large excavation trucks ruin their lawn, flowerbeds, trees, patios, driveways, walkways, parking lots, or whatever else is located above the buried sewer pipeline. 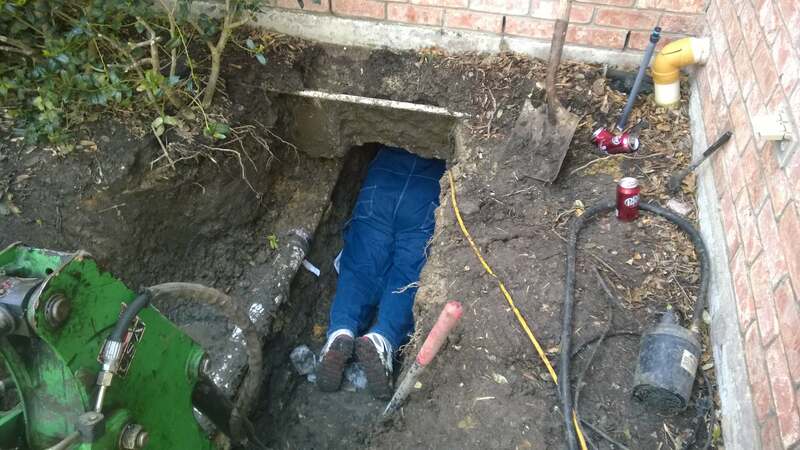 The question that remains is why are so many plumbing companies still digging trenches when trenchless sewer repair is a far superior approach? The answer may surprise you. They are either stuck in their old ways or cannot afford to invest in the technologically advanced equipment and training that it takes to make the switch. Either reason should not negatively affect you. 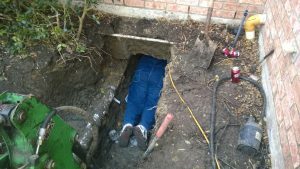 Property owners do not benefit at all when plumbing contractors incorporate the use of the traditional excavation method of sewer repair. The question you should be asking yourself is if the traditional excavation method offers zero advantages to the property owner then why would you hire a company that still employs the use of it? The Nu Flow trenchless pipe lining system provides plumbing contractors with the ability to repair sewer pipes in the most efficient manner possible. The process relies on technology as opposed to excavation. Once the existing sewer pipes are thoroughly cleaned with either a hydro-jetting machine or various pneumatic tools, a small access point is made at one end of the sewer pipeline. A high-tech machine uses the access point to push a felt liner that is covered in a wet epoxy resin through the sewer pipeline. When the liner is set in place a bladder is inflated. Once the wet epoxy resin dries the bladder is deflated and a brand new pipe, located within the old pipe is formed. The final step of the Nu Flow process is to send a video camera into the sewer pipeline in order to make sure that the process was performed correctly. When all is said and done the new pipe within the existing pipe will fix any leaks, cracks, and small breaks within the sewer pipeline. On average it takes a day to complete the process from start to finish. It must be noted that the traditional excavation method can take multiple weeks to complete. The Nu Flow trenchless sewer repair technique is approximately fifty-percent more cost effective as well and will last well over fifty years. It also avoids the added expense of having the landscaping and hardscaping repaired and or replaced. Sewer repair no longer needs to be the expensive, time consuming, and destructive process that it once was. To learn more about the trenchless sewer repair process please contact Nu Flow Technologies at your earliest convenience. We are also happy to answer any and all questions that you may have.